Last week, Claudia and I from Factor-H, together with the Venezuelan physicians and patient association (Avehun), we spent a day visiting the neighborhood of San Luis, outside Maracaibo. We hand-delivered clothes donated by our US friends and colleagues, to about 50 people living with HD in their families. It was a day where at least we brought a smile and a bit of help to our Venezuelan friends living with HD. Factor-H also donated money to buy food. To all who helped Nacho gather the clothes, thank you very much, from Factor-H and from the patients! Population: 6.264 in census – Regional Health System. 76 HD families identified, 13 families with more than 1 member affected (total current HD manifest individuals = 98). A full census is ongoing through local patient association (Avenhun Zulia). estimated prevalence for at-risk individuals is 1-5% of the total population. Basic needs: Food, clothes, wheelchairs, diapers, etc. Barranquitas is approximately 4 hours by car from the city of Maracaibo. The roads are not paved during long stretches, and there is a lack of access to adequate medical care in this area. Most people live from fishing in the lake Maracaibo. Flooding is seasonal, and housing conditions are mostly inadequate. Pictures below were taken during our visit in March 2013. We held a meeting with the local communities, to inform them of Factor-H and of recent advances in research to find treatments for Huntington's disease. The picture on the right shows an at-risk woman speaking out during our meeting. Barrio San Luis is a neighborhood in Maracaibo, Zulia. Of approximately 3100 people living here, 700 are at risk (23%). The prevalence is estimated to be extremely high, perhaps reaching 10% of all people living in this small and confined area near the city of Maracaibo. During our February/March 2013 visit we met with local caregivers and health workers. We visited a field where we could potentially help build a local hospice and youth center. Neither the local hospital nor the Casa Hogar (founded by Dr. Nancy Wexler) can accomodate all the patients suffering from HD. There is a great need for housing and medical care, in addition to basic needs. Many of the local youth suffer from discrimination, lack of social outlets, and proper professional training. Pictures taken during our recent visit in March 2013. The picture (lower left panel) shows Dr. Claudia Perandones, Dr. Roberto Weiser, myself, Aleska Gonzalez (Avenhun), Dr. Olmedo Ferrer, and other members of Avenhun, bringing bags of food and basic essentials (soap, detergent, diapers) to some of the affected families. Venezuela remains the country with the highest density of HD in a single location, in and around lake Maracaibo, in the province of Zulia. 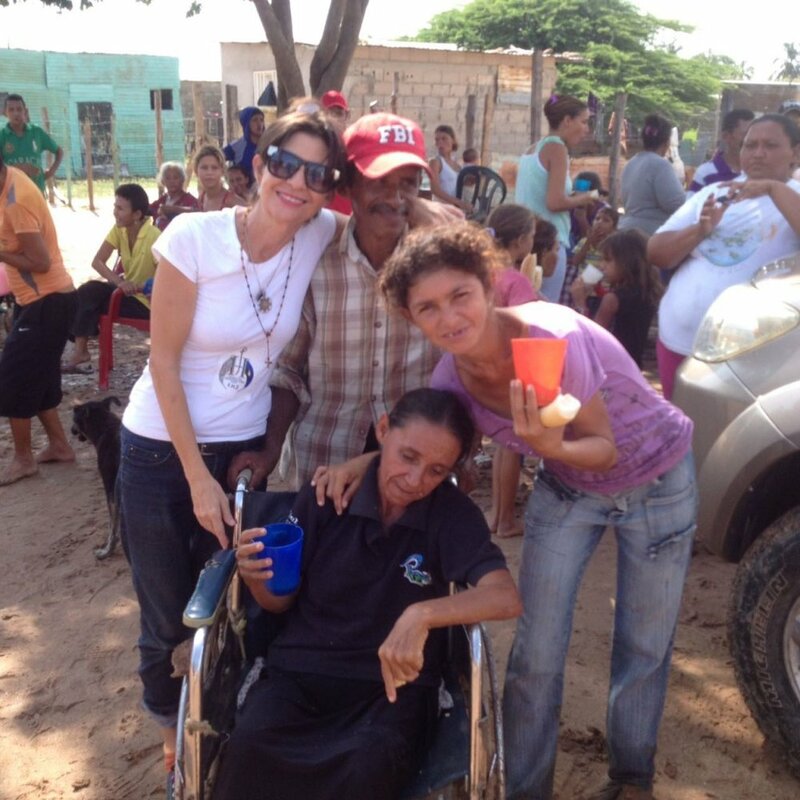 Factor-H is committed to helping the Venezuelan HD affected communities. The main communities in Venezuela with active Factor-H efforts are in Caracas, and in the Zulia communities of Barrio San Luis (Maracaibo) and in Barranquitas. Factor-H together with Venezuelan physicians and the patient association representatives visited the Zulia communities in March 2013. During this trip, we delivered food and aid to many affected families, and defined main areas of need for these communities. We also met with the local physicians at the Maracaibo University Hospital and the Hospital Barrio San Luis, and listened to their needs. Together we will work to bring better access to medicines, basic needs, and to build a better future for the newer generations living with HD. Claudia Perandones (Scientific Director of the Latinamerican network for HD) and myself will be visiting several of the affected communities in the upcoming days. We will visit some of the most devastated communities in Colombia and around lake Maracaibo in Venezula from february 23 through March 3, 2013. During this visit, we will speak to national and local physicians involved in the treatment of HD in these countries, as well as addressing directly the communities of affected members, their caregivers, and also speaking to local goivernment officials. This is the first time I will be visiting the communities and I am very excited -and anxious- about the trip. We will leep people updated on our travels and what we learn! we will be discussing how we can work together and defining projects to get our work started in these countries. We plan on visiting Peru and Brazil sometime later in the year. In Colombia we have organized a meeting between the local associations, Factor-H, and Habitat for Humanity, to define ways of funding and carrying out projects to support housing infrastructure for affected members of the communities.